It's time for the Annual Exploration Tour of The Milton Schoolhouse- and our first ever Studio Open House! Usually, we offer a grand tour of Milton's vast 85,000 sq ft in June to celebrate the anniversary of its purchase in 2009. But this year we wanted to make it EXTRA special. You've seen it on Facebook, now see it in the flesh! 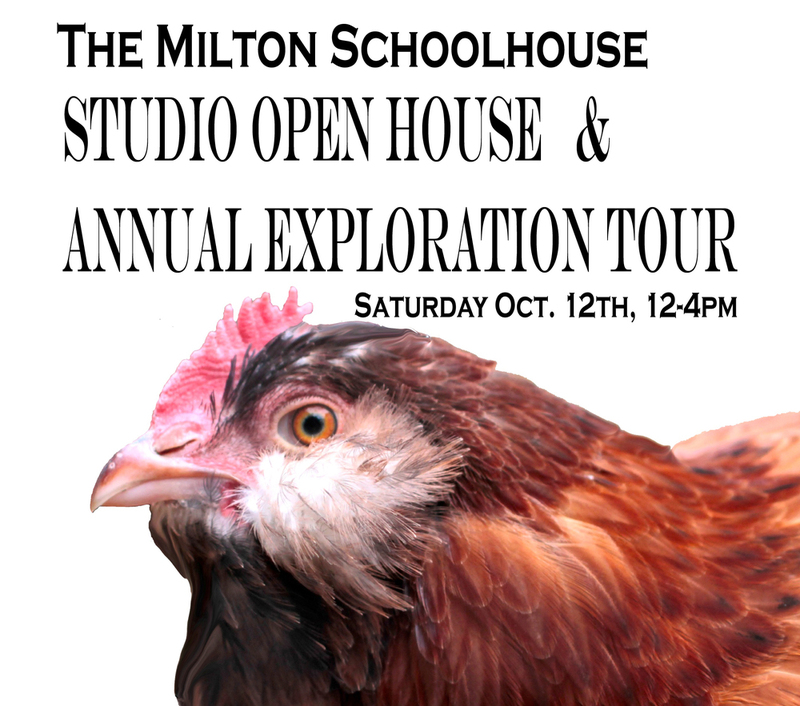 The Milton Schoolhouse will be hosting a Studio Open House Saturday, noon to 4pm on Oct. 12th! Come in at anytime and explore the ground and first floor of the north wing. Peek inside of our business studios, meet our artists and entrepreneurs, enter cool drawings to get some sweet prizes- and check out that swanky new bathroom we just remodeled. See two classrooms in their natural state- just before they undergo renovation this winter to create three new artist/entrepreneur studios! What's that you say? That's not enough to tempt you to Milton's doors on a lovely autumn Saturday? Well, reserve your space on one of three 1.5 hour tours that traverse the expansive building- exploring nooks and crannies that are only open to the public on one occasion: our Annual Exploration Tour! You'll get to see all of our work-in-progress, the creepy bits, our private hang out spots, the crumbling south wing, and ask as many ridiculous questions as you please. Plus- it's free! This active tour has lots of steps, so make sure you're up for a good walk-a-bout. Tour attendees will also receive a baggie of small gift-like surprises from Milton (no dead bugs, we promise). We are hosting a tour at noon, 2pm, and 4pm- all limited to 20 people each. You are welcome to just show up and tag along, but if you'd like to reserve your space in advance (and get something really unusual in the mail to act as your ticket/placeholder) you can drop Meredith a line at meredith.elston@gmail.com with your postal mailing address. If you are reserving a spot, please arrive 5 minutes BEFORE the scheduled start of the tour or we'll fill your space with walk in visitors. See you Saturday, Oct. 12th! Are you a small business owner or community coordinator looking for the BEST ways to create BIG success ? Sign up to get tips, tactics, and access to courses on everything from planning to problem solving. We respect your privacy. We will never sell or share your email. These articles on all things entrepreneurial and local business are authored by Meredith Elliott. Meredith is the primary financial stakeholder in the Alton/STL based incubator, The Milton Schoolhouse. She also co-owns and operates Maeva's Coffee and helps other small business owners through dynamic consulting via Elliott&Moose.